Jeffrey S. Rosell has been a prosecutor for over 25 years. He has worked in the Santa Cruz County District Attorney's Office since 1994 where he has prosecuted high profile jury trials for murders, child molestation, adult sexual assaults and gang crimes. Mr. Rosell supervise d almost every unit in the office including sexual assault, special prosecution, and general felony units before he became second in command as chief deputy of trial operations in 2009. He was appointed District Attorney in 2014. Throughout his career, Mr. Rosell has been a committed prosecutor and passionate advocate for victims of crime as they face the challenges navigating the criminal justice system. Mr. Rosell is dedicated to ensuring public safety in Santa Cruz County through ethical and just prosecution. His organization of the office includes specialized units to combat homicide, sexual assault, domestic violence, and gang-related violence. A consumer affairs unit fights consumer fraud, elder abuse and environmental crimes that threaten our health and our community. Mr. Rosell has implemented innovative programs to improve the Santa Cruz community including the Bob Lee Community Partnership for Accountability, Connection and Treatment (PACT, formerly DAP), which addresses chronic low-level offenders, giving them access to treatment while holding them accountable. Programs such as Veterans Court and Behavioral Health Court address the specialized circumstances of eligible offenders. Truancy Court helps keep kids in school, decreasing youth violence in our county. Jeff Rosell maintains excellent working relationships with all law enforcement agencies. 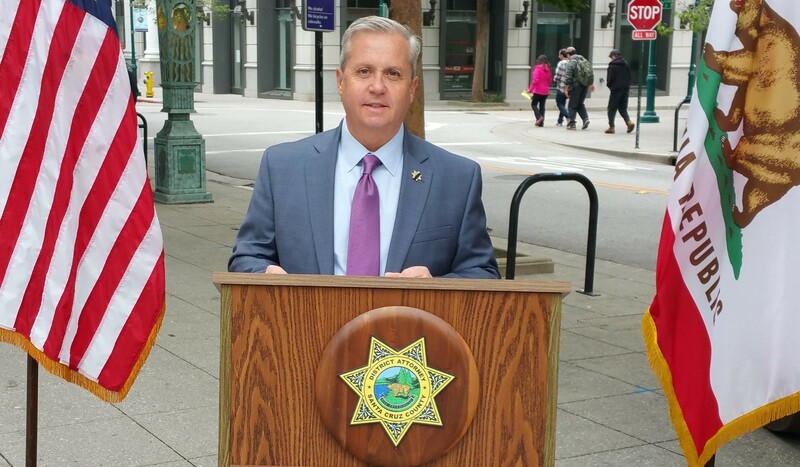 As a founding member, he committed DA Office Inspectors to the SC CACT, a task force collaboration with the Sheriff’s Office that combats gang and drug violence in the county. Mr. Rosell graduated from UC Santa Cruz in 1984, and earned his law degree from the University of Southern California in 1988. He practiced civil law for two years in southern California and spent four years as a prosecutor in Hawaii, before returning to Santa Cruz, where he has practiced ever since. The District Attorneys' Offices of Santa Cruz, Monterey and San Benito Counties are working collaboratively to form a Real Estate Fraud Advisory Team ("REFAT"). Team members will consist of agents, lenders, brokers, escrow companies, title companies, notaries public, etc., all sharing common interests such as protecting the integrity of their respective professions and avoiding, eliminating, and reporting potential fraudulent real estate transactions. Alameda, Kern and Ventura Counties have formed advisory teams that have been helpful in addressing fraud issues. The team will work to identify warning signs and to educate and inform the public of existing and potential new real estate scams. Launched in the spring of 2014, the Downtown Accountability Program is a partnership of City, County and non-profits agencies that works to improve the quality of life for chronic offenders through court accountability and treatment. Program leaders and supporting elected officials will present the outcomes of the first year of the program and honor the late Bob Lee, former Santa Cruz County District Attorney, who was instrumental in the program's development. "To promote and ensure public safety through ethical and just prosecution"
The District Attorney represents the People of the State of California in all criminal prosecutions in Santa Cruz County. The Office is responsible for filing criminal charges, appearing in court in all felony and misdemeanor cases, and representing the People in all trials and sentencing proceedings in the Superior Court of Santa Cruz. District Attorney Jeffrey S. Rosell is pleased to announce the start of the Veteran's Treatment Program. The program is a collaborative effort including the Santa Cruz Superior Court, the Public Defender, the Veteran's Affairs office, the Santa Cruz County Probation Department, and local volunteers who mentor veterans facing criminal charges. The program applies to all military veterans who are facing criminal charges in Santa Cruz County courts, regardless of their length of service, whether they served in combat, or their discharge characterization, said Baum. Veterans who choose to participate can "earn" dismissal of minor charges, or reduced charges in more serious cases, by participating in therapy, completing substance abuse, anger management or post-traumatic stress disorder programs, and performing community service. 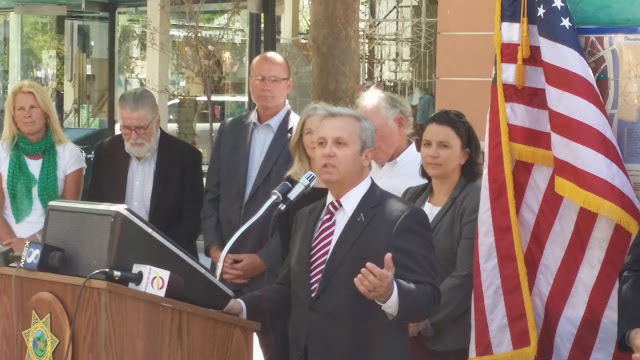 "While the primary goal of our office is always public safety," said District Attorney Rosell, "at the same time, we are looking for intelligent alternatives to custody that still protect the public and help our veterans heal." Additionally, volunteer mentors will be available to help the veterans through this process, by giving them rides to programs or court dates, helping them obtain housing or medical assistance through the Veteran's Administration, or just being there to listen. The volunteers were recruited and trained by Stoney Brook, a retired Inspector from the District Attorney's Office and a Vietnam veteran. About half of all California counties have specialized veteran's courts. "Three veterans have already begun their participation here in Santa Cruz, and those numbers are expected to grow as the program formally gets under way," said Rosell.